Shepherd Crest lies just inside the eastern border of Northern Yosemite, across the Sierra Crest from the Hoover Wilderness in the vicinity of Saddlebag Lake. I had chosen this for the second day of the Sierra Challenge not because of its height or prominence, but because of its history. Some of the more prominent early explorers to the range were geology and other professors from the University of California and Stanford, having come to the range to understand and explain its origins and development in this new field of science that had only recently recognized the great age of the earth. Among these was Francois Matthes (whose name adorns a famous crest in Yosemite and glacier on the north side of Kings Canyon NP) who first described Little Lost Valley in the 1933 Sierra Club Bulletin following a visit that same year. The feature, located immediately below the west summit of Shepherd Crest, is a small remnant of an ancient valley formed in the Eocene age, uplifted and left hanging when most of its surrounding terrain was cut away during repeated glaciation episodes. It was given a second mention in the 1949 SCB when it was visited by a party led by Richard Leonard (who has a minaret in the Ritter Range named for him). Secor gives a brief mention of this in his guidebook and it was this that first piqued my interest. Over the years I've put together a partial collection of original SCB manuscripts and happen to have the 1949 version, but not the 1933 one. After reading the former I put Shepherd Crest on the list for this year's Challenge even though I'd already been to the higher east summit. Because the mileage is not very significant, I gave each of the two summits equal weighting, requiring both to be climbed for full credit. They are separated by a mile-long, serrated ridgeline that I had guessed was not a viable route between the two - only to be proven wrong, as we shall see. 20 of us assembled at the Saddlebag Lake dam at 6a before starting off around the lake's west shore. The drought and late season had taken their toll on the lake level, as low as I've ever seen it, actually below the bottom of the dam. Sunrise came only moments after starting out, with Shepherd Crest and Excelsior Mtn in front of us to the north picking up some of the first light along with North Peak and Mt. Conness to the west. 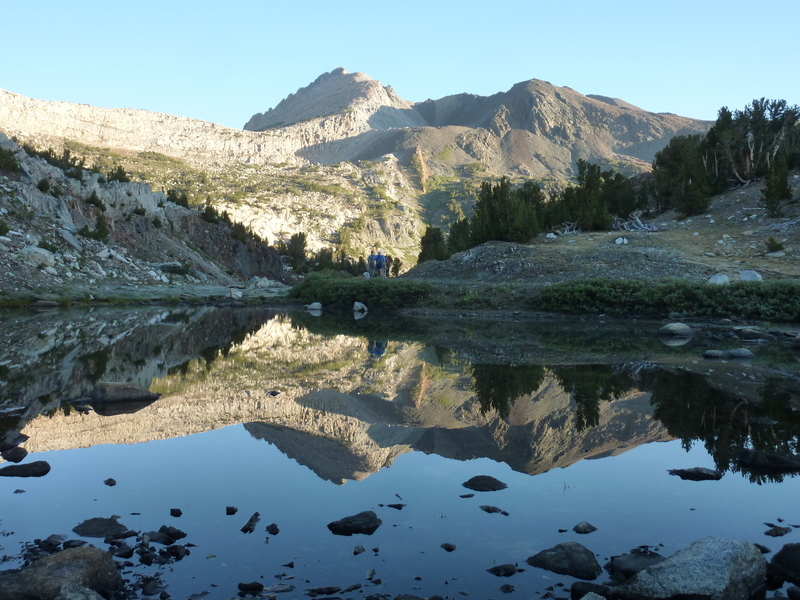 We followed various trails, some official, some use trails as we made our way to Lake Reflection with a beautiful view of our summit mirrored in the lake's calm surface. We found a use trail continuing higher, eventually losing it in a short rock band that we scrambled up, our group beginning to splinter and disintegrate as the various participants began to choose different routes. The ridgeline leading up to the east summit is steep but good footing over a mix of boulder, talus and sand. It took less than two hours to reach the highpoint at the east end of Shepherd Crest, one of the shortest times to reach a summit I can remember during the Challenge. Looking down at Saddlebag Lake we could clearly see the wake from the first ferry making its way to the north end of the lake with its load of passengers. Elsewhere the skies were fair with good air quality providing us fine views overlooking Yosemite and the Hoover Wilderness. Looking northwest we could see the difficult-looking ridgeline stretching for more than a mile to the west summit. Eric eyed it carefully in deciding whether to give it a shot. He tried to talk me into joining him on the adventure but I would have none of it. Within about 15min we had assembled a large group of 12 for a summit photo. About five minutes later we began to disperse, about half heading down to the pass to McCabe Lakes for the roundabout route to the west summit, a few heading to North Peak, others heading back to the TH, Eric venturing solo along the ridge. On the way down from the east summit I met up with brother Jim and a few others taking a more leisurely pace, and just below them was a familiar face that had started late - Daria, who we hadn't seen on the Challenge in a few years, had decided to join us once again. She asked if we couldn't wait for her to tag the summit and come back down, but as Tom Grundy would have put it, "That isn't how we roll." Having beat me up and down summits on numerous occasions in the past I assumed she'd catch up with us shortly, but that wasn't to be the case today. We crossed over the pass leading down into the delightful McCabe Lakes basin. I traveled with the front group of six, including the familiar faces of Michael, Nick and Chris. Chris had gotten stronger since the previous year and was keeping a much faster pace than I'd seen in the past. New faces included Sean Reedy and Rob Wu, the latter looking particularly strong. He had finished second on the first day and seemed eager to keep a fast pace. We wandered down the drainage below Upper McCabe Lake losing various members of our party in the forest and among the mild brush sections. Using my GPSr for reference, I turned right when it indicated we were nearly below the South Chute leading up to Little Lost Valley and the west summit. Sean made a tactical error here, wandering an hour further down the drainage before realizing he'd gone too far. The South Chute proved a good route though steep, loose and not just a little bit tiring. The class 3 rating seemed fair, mostly due to short sections of sketchy steep sand on disintegrating vegetation. With Rob leading most of the way, we finally reached the dry, talus-lined basin of Little Lost Valley around 10:15a. I'm not sure what I was expecting, perhaps dinosaur bones sticking out of the talus or other ancient artifacts, but it was really just a lot of granite rock pieces of various sizes and shapes like many other places in the Sierra. The shape of the valley didn't strike me as all that different from perhaps a dozen similar features I've seen elsewhere. Still, this was the one identified by Matthes in the early days of studying Sierra geology and it got some attention. We hiked to the east end of the valley before climbing more tedious slopes to the highpoint, all class 2, arriving by 10:30a. Even better than the fine views was an incredible original register containing the tattered names of the first ascent party from 1933. Various other scraps held entries from the 1940s right on up to the most recent from 2012, in total less than two dozen parties. The pages were battered but mostly readable, and it took some time to unfold them all and photograph their contents. Meanwhile, we spotted Eric making his way across the crest and not ten minutes later he'd joined us at the summit. He reported the hardest move at 5.7, the hardest ridge traverse he'd yet done (which is saying something, considering the number of Sierra ridgelines he's traversed). None of us were sorry to have missed the "fun" that he described as something he'd not do again. Our twelve at the east summit was reduced to five at the western one, but we were not the last to reach the top. On our way back down we came some of the others in Little Lost Valley, a few more in the South Chute. Someone had reported traversing the south side of the crest starting from near the pass which might obviate the need to drop back down into the McCabe Lakes drainage (and regain all that elevation to the pass) and after dropping only a short distance in the South Chute I decided to investigate this. What followed was lots of interesting scrambling through cliff sections of rough granite across several ribs and chutes, but in the end a time sink. Rob had started with me but quickly changed his mind to return to the main chute. I could not find a reasonable path across the face and without knowing if I was too high or too low I punted after half an hour's effort. I dropped back down into the drainage and made my way through forest and meadow, eventually running across Chris who was boldly attacking the heaviest brush head-on in a strong effort to show it who's boss. My pants already in tatters from much abuse of a similar nature this past year, I headed right to use some slabby areas south of the drainage and give the heavier brush a wide berth. Above this brush section I came across Eric napping in the shade of a large boulder. He and pal Brad had gone to the east summit together before starting for the second one, whereupon Eric decided he'd had enough and would rest and wait for Brad to return hours later. It was a very long wait, but Eric didn't seem to mind. Alone again, I climbed back up to the pass, crossing paths with a party of four backpackers dropping to McCabe Lakes. They seemed to be having a good time despite the load on their backs and the awkward descending of the use trail over roots and boulders as the slope drops steeply. Leaving Yosemite at the pass and reentering the Hoover Wilderness, I dropped to the small unnamed lake just east of the pass to find a gentleman with a daypack resting there. At first thinking he was with the Challenge, I soon realized he was out on his own. He told me a story of his last visit to this area more than 50yrs ago. Turns out, at 81yrs of age he was born the year after the oldest register entry we'd just seen on the west summit and made for an interesting connection between two disparate ages. And he was doing pretty darn good to get to this point at his age. Finding the use trail heading down towards the larger lakes below, I began to come across increasing numbers of folks - fishermen mostly, but campers, and day trippers as well. The ferry appears to do a brisk business at the height of the summer season in August on a Saturday, bringing hundreds of folks to the area in a continual back and forth effort across the reservoir. A woman stopped to ask me if I knew where a particular lake was, "the fishing spot" she was led to believe. I had no map with me and the crude one she had showed only the various lakes without any contours and very few other defining features. Still, I was able to tell by the shape that Wasco Lake was the one I had just passed. I couldn't imagine she or her charges would have any luck, however. Of the dozens of folks I saw fishing without so much as a nibble and by guessing how popular this area is, I can't imagine there being very many fish left at all. Eric Su had beaten me back to the TH by an hour, and as expected held the lead in the Yellow Jersey. Robert Wu was at least giving him a run for his money, only 10min behind today and 20min overall. Still, at this rate Eric would walk away with a sizable lead by the end. In addition to both summits on Shepherd Crest, Chris Henry had gone on to do North Peak, taking more than 10hrs but giving him the lead for the Polka Dot Jersey. Sean Reedy managed both Challenge summits but his error between the two made for a long 12hr day. Two others that made no such mistake took even longer - Matt Yaussi at 12 1/2hrs, Brad Dozier almost 14hrs (! ).